Whoa. 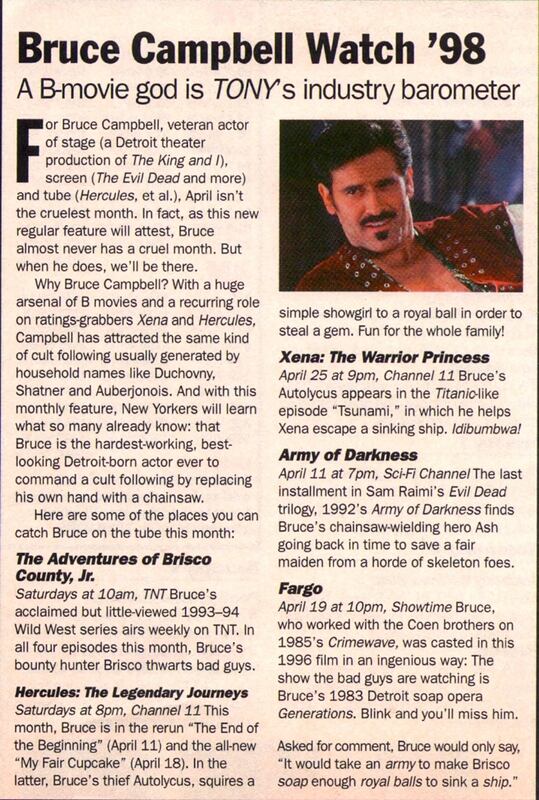 You won’t believe this but I actually got around to updating the Time Out New York and TV Guide sections of the clips section of this website. I know! Crazy! 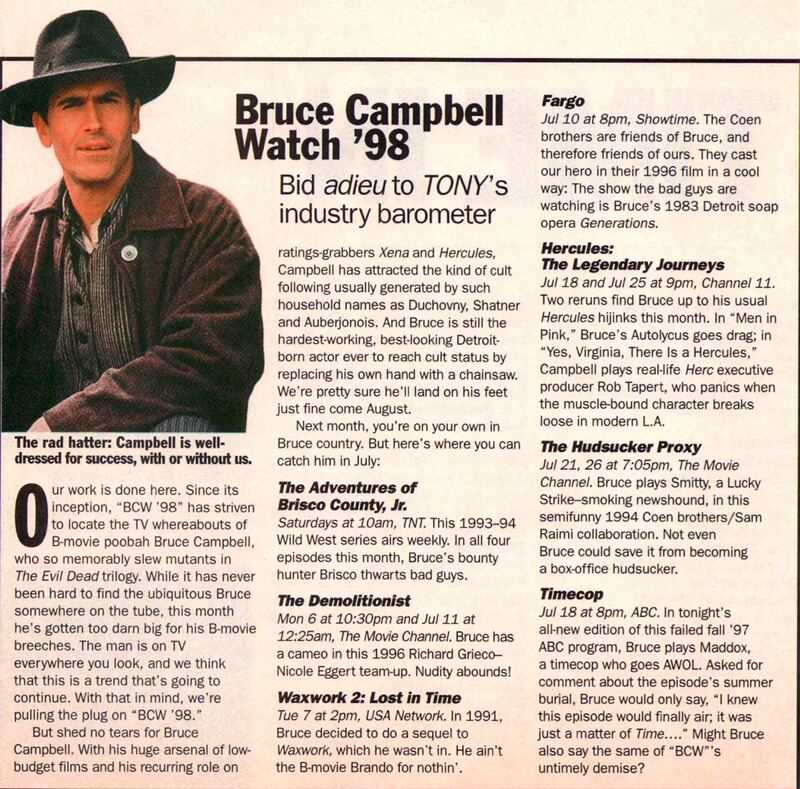 The Bruce Campbell Watch ’98 is finally online. 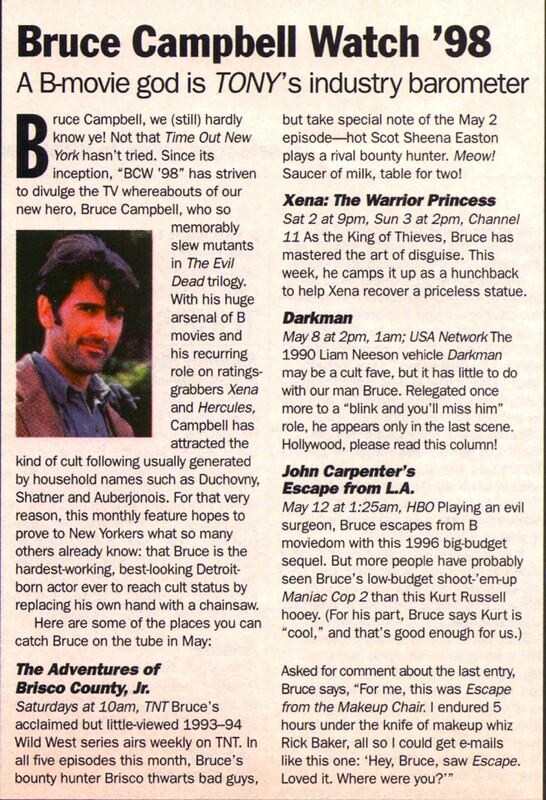 What is the Bruce Campbell Watch ’98, you ask? In 1998, midway through my stint as the television editor at Time Out New York, I decided, for no reason whatsoever, to pick one underrated cult actor and trumpet the hell out of him over the course of a few months. The only option? B-movie poobah Bruce Campbell, whose work I’d gotten into entirely due to the maniacal urgings of John Hodgman. 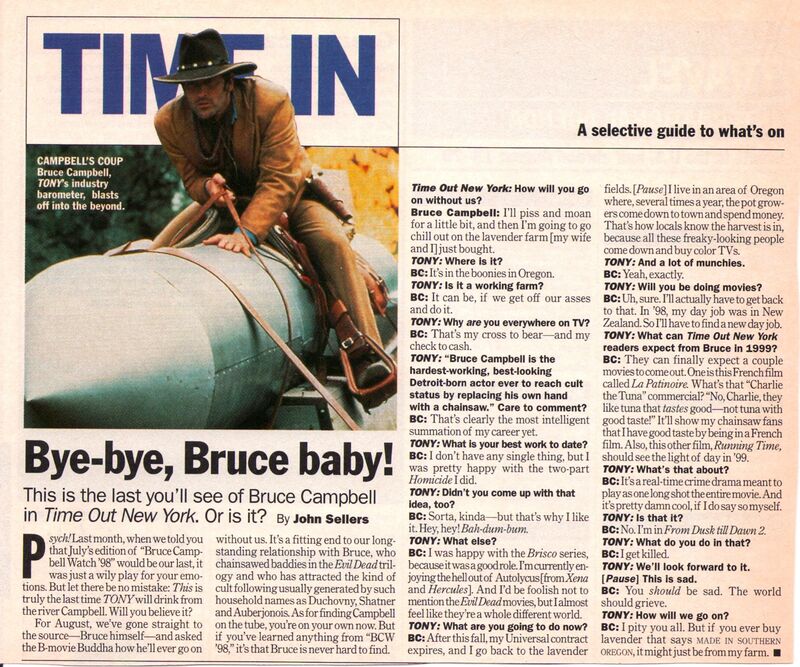 And so I scoured programming listings each month to find every Campbell-related appearance, no matter how brief or obscure, and then asked Bruce himself to weigh in on the gimmick. The results of this completely misguided experiment are posted below. I am convinced that the Olive Tapenade Council needs to employ me as its sloganeer. This afternoon, as I reached for two packages of the delicious concotion, Eddie Money’s “Two Tickets to Paradise” came to mind — only with the following lyric: “I’ve got two tubfuls of tapenade/Toast some bread, we eat tonight!” But now I can’t get the bastardized song out of my head. I’m pretty sure I’ve been Bacon’d. Posted on January 26, 2009 January 26, 2009 by johnsellers	This entry was posted in Celebrities, Guilty Pleasures, Interviews. Bookmark the permalink. FYI – we over at GeekDad are keeping up the Bruce Campbell watch in spirit, including a post today about his success on his current job: . Back when it first became possible to do one’s banking via the Internet, my friend was adamant that some financial institution was missing out by not using the Carl Douglas hit Kung Fu Fighting to advertise the ease of such an endeavour. She envisioned a montage of people happily typing away, paying their mortgages and depleting their lines of credit to the chorus “Everybody was online banking.” Their typing would synchronize with that little Asian-esque “da-da da-da dat dat, dat dat DAH” phrase. Now it is literally impossible for me to move money around without hearing it. But who on earth is that handsome devil in the background of Clip #3. And where is he now? El es un diablo feo!